This is an Italian heirloom from the town of Chioggia, near Venice, and has been popular since the early 1800s. It's beautiful and sweet flavored. Sliced roots look like bull's-eyes having concentric rings of white alternating with wine-red. The green leaves are an excellent spinach substitute. Beet, Chioggia is rated 4.3 out of 5 by 15. Rated 5 out of 5 by maryrose from perfect beet I had never grown beets before. This seemed unusual so I gave it a try. WOW! The red and white stripes mixed together to make pink and the flavor was amazing. When I ran out of beets from my garden I bought some at the local farmer's market. Those were the deep dark red type. The flavor didn't come close to Chiogia. I will not grow another beet. Rated 4 out of 5 by TravelingAnn from Fun beets First time planting beets. Selected this variety because of the fun stripes. My first planting in the early spring (April?) did very well, although most of mine seemed to result in baby beets (maybe I didn't understand the size from the subscription). The tops/leaves got VERY big, which was overwhelming for my small plot. Second round of planting (June) doesn't seem to be growing as well. They were tasty. Rated 5 out of 5 by Vegetable Lover from Fast growing, easier maintenance, so tasty raw! These beets, when raw, tasted a lot like apples. I just chopped them up in salads and also added one of three Burpee's Zucchini cultivars that I planted this year. Very nice. Rated 5 out of 5 by Leopard825 from Delicious! I am not a fan of beets but planted these for other family members that are. I was pleasantly surprised when we plucked these out of the ground and cooked them. They are not only beautiful but have a very mild sweet taste! I highly recommend them! Rated 4 out of 5 by MAdair from Try this Beet Raw This was the first year I had grown this beet. Chioggia is excellent eaten raw. Try it peeled and sliced it has an great crunch and sweet taste. I am not a fan of the leaves of this vegetable and prefer Bulls blood or Little Chicago leaves for salads. This beet cooked looses much of the candy cane coloring that makes it so eye catching. This plant is if quick growing with good germination. This is a very good and early producer. 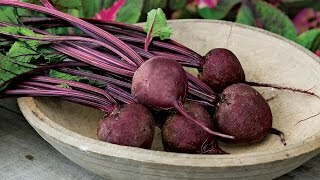 Give them a try if you have room for a second variety of beets. Rated 4 out of 5 by BrewBelly from Sweet, but Sensitive High germination rate and fast foliar growth. The beets are rather small, but very good tasting (sweet). The plants are heat-sensitive and I have to water once or twice a day to keep them from wilting (the other three varieties growing in the same plot don't wilt). For Florida, probably best in cooler months. Rated 2 out of 5 by Mary2012 from Chiogga Beet We havent had any sprout. Replanted again. Rated 5 out of 5 by urbanfarmlady from Delicious Beets! 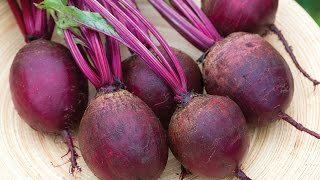 I grew Chioggia Beets last summer in a brand new garden space and they were fantastic. They have a very sweet taste and the rings were beautiful. I received many compliments on them. I cut the beet greens for salads and green smoothies, they were quite prolific. I ate the beets raw and used them in stir fry dishes. Be sure to peel the tough outer layer off.